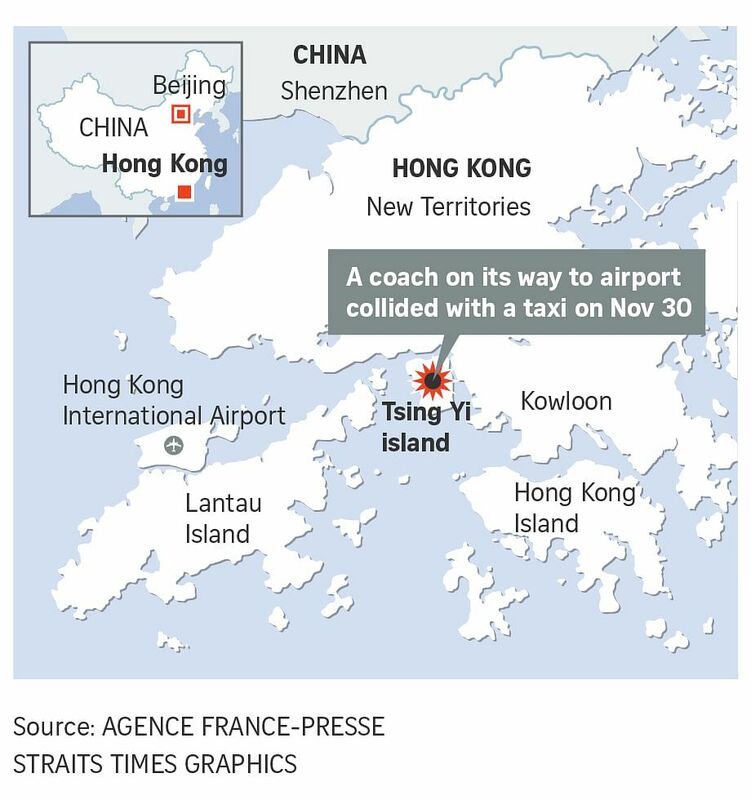 HONG KONG (AFP) - Five people were killed and 32 injured when a coach carrying Cathay Pacific staff to Hong Kong's airport collided with a taxi on Friday (Nov 30), police said, with passengers thrown from the coach's windows on impact. "We believe the taxi was broken down and stopped on the left lane of the road. Around 40 seconds later, a coach hit it from behind," police superintendent Yip Siu Ming said. The taxi driver and two men and two women coach passengers were killed, according to police. Debris including glass and personal belongings was strewn across the road, which remained closed early Friday. Superintendent Yip said police would look into whether the coach driver - who had been working for 10 hours at the time of the accident - had been tired or affected by alcohol. "From what we can see, it's obvious that the driver did not see the broken-down taxi on the road and hit it from behind," Yip said, adding that his working hours were from 7pm to 7am. One coach passenger said the bus had been travelling fast before it crashed into the taxi which had its hazard lights on, according to SCMP. "It seemed to me that the coach did not slow down. I fell onto the floor (when it crashed)," the passenger said. A passenger told local television channel TVB the scene on the bus was "very chaotic, we were crushed together". Another said "the bus hit once, then hit left and right, and hit the roadside to stop." The accident happened at 5am near the exit of a tunnel.